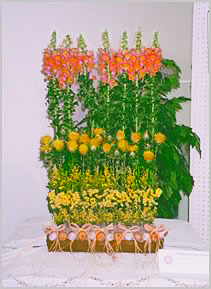 CFAA is authorized by FDA (Flower Decorators Association) in Japan. CFAA provides students with education based upon the credit/unit system. CFAA has been introduced in the famous magazine called "Florists" in Japan as well as books featuring floral arrangement by the title of "We are Flower Decorators" and "The secret for the successful operation of Floral Art School". For students who have successfully finished the course, CFAA issues Certificate or Special Award. The Managing Director of CFAA, Mieko Martha Hirano, has been engaged in floral art activities in the past 38 years and she is well known in the industry. In addition to Japanese Students, CFAA has several different nationalities students from Taiwan, Indonesia , India, Korea and USA with the atmosphere of International Culture. Upon request from students, CFAA provides students with English lessons. CFAA offers the wide range of courses from Elementary to Professional Course. CFAA can provide students with "MAN TO MAN" lessons based on "tailor made" education. CFAA sometimes participates in the events held by Santa Clara County Government and students may have good opportunities for experiencing the Actual arrangement at the Official Event Place. CFAA offers variety of art lessons ranging from Floral Arrangement to "Three Dimensional Art" called "Shadow Box Art" and "Decoupage". Copyrights© 2002 California Flower Art Academy All rights reserved.